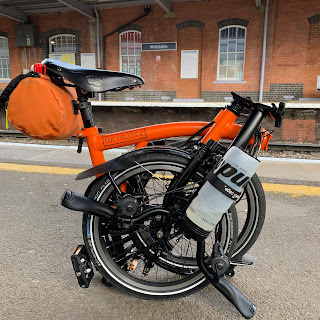 My Orange Brompton: The wait for the Brompton World Championships is almost over! The wait for the Brompton World Championships is almost over! Well, the waiting is over. The Brompton World Championships is almost upon us. Like many I have written and talked about this for ages and it is now less than 24 hours until possibly THE cycling event of the year takes place. Yesterday I went for a final training run with my partner in crime iCrazyBee. We went to Hyde Park in London and did a few circuits. I took with my a little, Garmin Edge 200 which I bought second hand from a work colleague. It is pretty good and the statistics and charts from Garmin Connect are quite amazing. Expect a mini review when the BWC is over. All of this week I have gone out on little training runs just to keep things ticking over. It is my intention to continue this as much as I can as a post BWC legacy. I honestly do not know if I am any fitter than last year or whether I will post a better time? The Marathon, 26.2 miles takes place before the BWC and I do want to complete it but I will ride at a fairly sedate pace. 1 On top of the helmet. 3 On top of the main frame near the Brompton logo. Having testing all three positions, I think that it is going to be option 3, despite the fact you get a view of the handlebar stem. For me it provides the best view. My outfit is all ready and waiting and waiting it will as I have no intention of putting it one until after the Marathon. This way it won't get too dirty from the exertions of 26.2 miles in what should be a very hot day! So, there really is nothing left to do but get the final bits and pieces together and try and get a descent nights sleep. I get up very early tomorrow and it should be a great day. Hope it goes well for you, Good Luck! I joined the Brompton Owners Club!